Wayne Rooney has failed to justify himself a starting position in the Manchester United squad, and many fans are calling for Jose Mourinho to drop the 30-year-old. Let’s take a look at Wayne Rooney’s career as a whole and try and pinpoint where it all went wrong, before we list four reasons why Jose Mourinho should drop him. Wayne Rooney began his football career playing in the Everton Youth squad. He joined the Toffees in 1996 and made his senior debut for the club in 2002 when he was only 16-years-old, providing an assist in his debut match. Rooney took the English game by storm, stirring up interest from high-profile clubs like Liverpool, Manchester United, and Arsenal. After spending two seasons with Everton, scoring 17 goals in 77 appearances, Wayne Rooney requested a transfer away from Everton, with Manchester United being his eventual destination. The Red Devils paid a then record (for an U20 player) £25.6 million for the 18-year-old striker. Rooney made his debut for the club in 2004, scoring a hat-trick and providing an assist to forever embed his name in the minds of Manchester United fans. Sir Alex Ferguson, the man who brought Wayne Rooney to Old Trafford, often played him in a centre-forward position or striking position. However, ever since the departure of Sir Alex Ferguson, things took a turn for the worse. David Moyes, who coached Wayne Rooney at Everton, kick-started Rooney’s transition into midfield. The transition seemed complete when Louis Van Gaal came into the Old Trafford hotseat. However, the change of position doesn’t seem to have worked at all. Rooney’s form has been on a constant downward trajectory, and it has no signs of improving. Manchester United’s latest boss, Jose Mourinho, has tried to pull Wayne out of his rut by reinstating him as a forward, but it looks like the forward’s best days are past him. In his 13 years playing for Manchester United, Rooney has scored a total of 246 goals. An impressive tally, considering he only made 527 appearances. 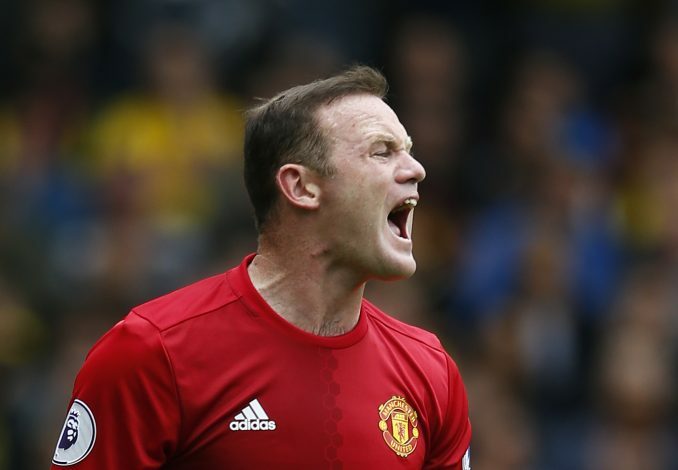 However, during the past two seasons, Wayne has only scored 30 goals in total, and has failed to score a goal for Manchester United during his last five games. During Manchester United’s EFL Cup tie against Northampton, Jose Mourinho started Wayne Rooney upfront, and the skipper still failed to produce. He came close on a few occasions, but he had nothing to show for it. Before the match, Jose Mourinho made it clear that he was hoping for Wayne Rooney to score at least one goal to try and help his cause. But Mourinho was left disappointed, having to sub on Marcus Rashford to secure United’s win. Without goals, you cannot win a match, and if you have a misfiring striker, there is no point in playing him. Mourinho should rather shove Marcus Rashford up-front, as the kid is certainly in better form than Rooney. Rooney is 30 years old at the moment, turning 31 in October. But he began his playing career when he was only 16 years old. It looks like the time is catching up to the Englishman. Rooney, throughout the years, has sustained various injuries which have certainly taken their toll on him. His pace and agility have both been affected, and it looks like every match is a struggle for the 30-year-old. Maybe it’s because United constantly depend on him to pull through in every match. Paul Pogba, Henrikh Mkhitaryan, and Juan Mata would all fit into the central attacking midfield role perfectly. They are all younger and vibrant, each looking to earn their respect from the football world, just like Rooney has been doing. Wayne Rooney, despite all his leadership qualities, should think about giving up the armband, instead of prolonging his now lifeless career. He will certainly never be forgotten by the Old Trafford crowd, but it looks like the time has come. Based on current form, Rooney would probably rank somewhere towards the bottom of the Manchester United squad. The fact of the matter is, Jose Mourinho has much better options besides Wayne Rooney is both midfield and attack. Yes, Wayne Rooney has been carrying Manchester United on his back throughout the years, but time is running out for Wayne. Jose Mourinho needs to see the results, and fast! If the Special One can’t manage to guide Manchester United into a top four spot this season, then he would be fearing for his job. Wayne Rooney, who can be played in both attack and midfield, has fallen behind many players in terms of form. Zlatan Ibrahimović and Marcus Rashford are two strikers who have been in great form for Manchester United this season, and the pair can help catapult United back to the top this season. In midfield, the Red Devils have the much older Michael Carrick, Spaniards Juan Mata and Ander Herrera, as well as Henrikh Mkhitaryan, all waiting to prove themselves to Jose Mourinho. Mourinho should drop Wayne for some time to experiment who is the best in the No.10 role before he makes his final decision as to whether he should allow Wayne Rooney to stay or not. Wayne Rooney is not the spring chicken he was when he first joined United back in 2004. Over the years, the skipper has been faced with many challenges. However, his physical attributes seem to be slowly disintegrating. Pace is an integral part of the game, and the lack of pace in a squad will mean that the team will struggle to get past opponent’s defenses. Rooney is more of a controlling player, but if he is to score goals and play as an attacker, he will need pace, which the England international seems to lack at the moment. Jose Mourinho has been trying to retain Wayne Rooney in the Red Devils squad, but the time has come to accept the fact that he is nothing else but a hindrance to the current Manchester United squad. Without a doubt, Wayne Rooney has been one of the greatest Manchester United players of all time, but the time has come for him to give way. United’s teenage star Marcus Rashford has much more pace than Rooney, and even Zlatan appears to be more physically attributed, despite being 4 years older than Wazza.